From ideation to operation, the bundles that make up the ANSYS Discovery Product Family help to bring the power of simulation driven product development to every engineer, faster and more affordably than ever before. Register to explore an in depth look at ANSYS Discovery AIM, Live, and SpaceClaim, covering their individual capabilities and newly updated features thanks to the latest version of ANSYS, ANSYS R19. 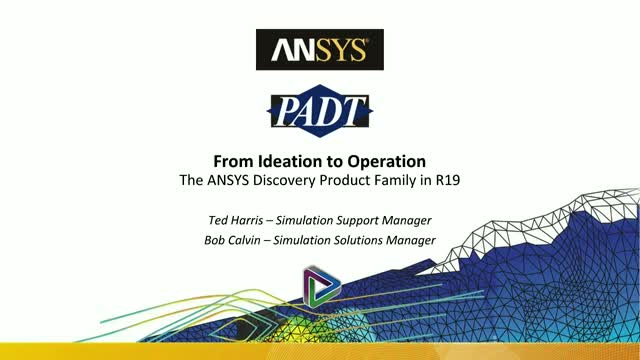 Join PADT's Simulation Support Manager Ted Harris, and Simulation Solutions Manager Bob Calvin as they cover each of the products that makes up the Discovery Product Family, how they are bundled for your benefit, and how the new ANSYS Discovery Marketplace simplifies the purchasing process.